06-Oct-2004 -- We visited the Confluence during a round trip through northern Tunisia. During our visit, we met a resident Bedouin, who is living near the Confluence. 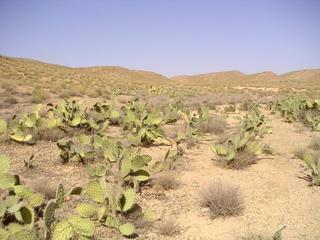 He is the user of the cactus field, which is covering the Confluence. So we were not the first visitors of this point, we were only documenting it for this project! I want to thank him for the warm welcome! After our return to Germany, we post processed the collected GPS data using RINEX files from the Cagliari base station in Italy. The results proved that we were really close to the Confluence. #7: Our approach to the point plotted on a georeferenced 1:1,000,000 Michelin map. Note the low accuracy of the street heading south!